This herb is still little known in the west for its medicinal properties but is widely used in Indian ayurvedic medicine where it is known as "gokshura". In Ayurveda it is considered a tonic and its effects are sometimes compared to those of ginseng, although the two herbs work through entirely different mechanisms. 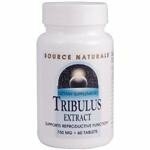 Tribulus terrestris supplements are mainly promoted for the enhancement of sexual health through their ability to raise hormone levels. Independant studies have verified that the herb does indeed raise hormone levels but only modestly, leaving them within the normal range. A number of sources state that Tribulus terrestris elevates testosterone in particular by stimulating production of gonadotropin-releasing hormone (GnRH). As such it has become popular with body builders despite research indicating that the herb only raises testosterone considerably when there is a deficiency to start with. Tribulus terrestris also has powerful effects on the liver stimulating bile flow and increasing levels of glutathione. Other benefits reported include immune stimulation, anti-fungal properties and heart protective effects. I only discovered Tribulus terrestris earlier this year and now feel very fortunate to have stumbled across it whilst researching stress online. As a chronic fatigue syndrome sufferer I am constantly feeling fatigued and drained as well as being unable to cope with stress. I wanted something to give me a boost and allow me to cope more easily with day to day tasks. Tribulus gave me results better than I would ever have expected. After taking one 750mg tablet per day for 5 days I really began to feel a sense of well-being and I was able to cope with a lot more without becoming stressed. I had not felt such a powerful stress relief effect before except with DHEA supplements. Unfortunately I was unable to continue with DHEA due to liver complications. Unlike DHEA however, Tribulus actually improves liver function along with its stress relieving effects. I contantly have pale coloured stools accompanied by abdominal pain which is associated with poor liver function. Taking Tribulus leaves my stools a nice healthy brown colour and stops the abdominal pain/inflammation within a day or two. I was so amazed by this that I checked the available research and there are indeed a number of studies indicating that Tribulus has powerful beneficial effects on the liver. I've been taking this herb at the same dose for a number of months now and continue to feel the benefits without experiencing any side-effects. Tribulus is now available from most healthfood stores and prices although higher than some herbs are not bad and well worth paying.